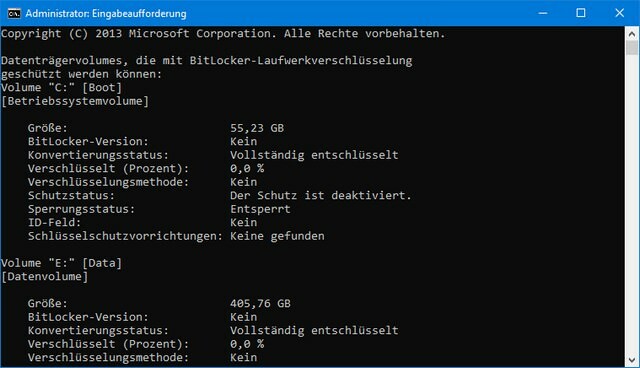 [German]Microsoft has released a new Security Advisory on November 6, 2018 with hints for hardware and software encryption on Bitlocker SSD drives. Fits to a topic that I mentioned a few hours ago in a separate blog post. Within the Security Advisory Microsoft reacts to exactly the fact that I mentioned within the above article that Bitlocker encryption of SSD drives is vulnerable if the hardware-supported variant is used. What says Security Advisory ADV180028? In the ADV180028 Microsoft confirms that there have been reports of a vulnerability in the bitlocker encryption of SSD drives and provides specific advices. How to check the used Bitlocker encryption method? If an SSD is built into the system, Microsoft suggests using the command manage-bde.exe -status in an administrative command prompt (The abbreviation bde presumably stands for Bitlocker Device Encryption). 1. Open an administrative command prompt (e.g. enter cmd in the search box and use the context menu command Run as administrator). 2. Execute the command manage-bde.exe -status within the command prompt window and inspect the status messages. If none of the listed drives reports “Hardware Encryption” in the Encryption Method field, then this device uses software encryption or there is no Bitlocker encryption. Then the machine with its drives is not affected by (newly disclosed) vulnerabilities . I am affected, what should I do? After a drive has been encrypted using hardware encryption, switching to software encryption on that drive will require that the drive be unencrypted first and then re-encrypted using software encryption. 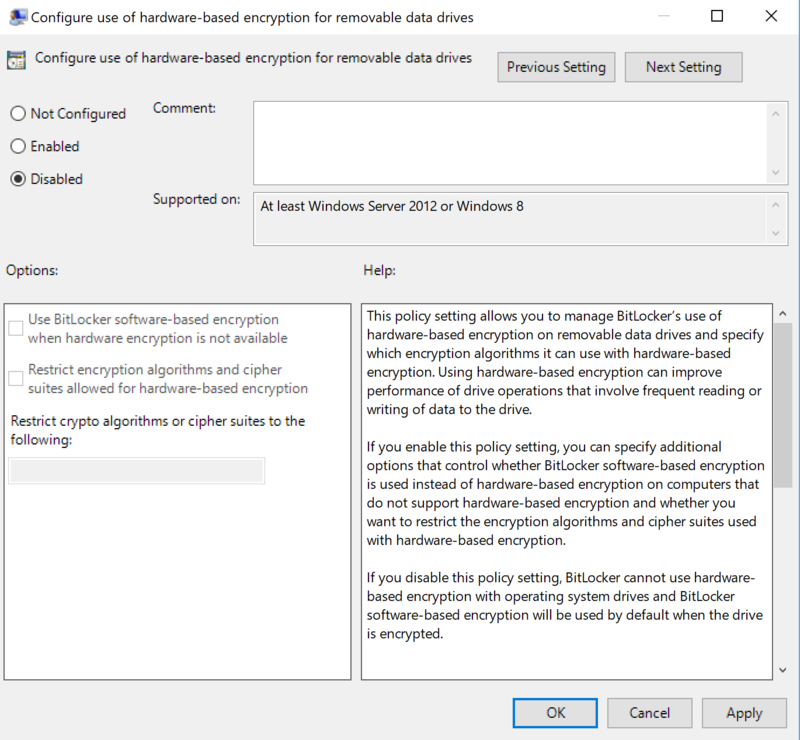 If you are using BitLocker Drive Encryption, changing the Group Policy value to enforce software encryption alone is not sufficient to re-encrypt existing data. Configure a Group Policy to enable forced software encryption and deploy it to the affected drives. Turn off Bitlocker completely to force decryption of the drive. After decryption, re-encrypt the drive by enabling Bitlocker. IMPORTANT: You do NOT need to reformat the drive or reinstall any applications after changing BitLocker settings. The Group Policy settings for Bitlockers can be found in this Microsoft document. For additional questions or ambiguities, Microsoft ADV180028 should be consulted. All in all, it must be said that Microsoft has reacted. It might be the GPO described here, that changes the encryption method. Martin Brinkmann has a more detailled description about that GPO at ghacks. But that thing is getting even stranger. Microsoft writes, that hardware based encryption support is beeing used by default, if supported (the settings within the GPO properties are indicating the same). I received feedback from 2 German admins/consultants, administering large Windows install bases. They tolde me, the didn’t found a machines using hardware based encryption. Maybe something is still missing, so no Windows machine is able to use haredware based encryption? This entry was posted in Security, Windows and tagged Bitlocker, Security, Windows. Bookmark the permalink.